In our last post, I mentioned that I planned to blog more about cemetery work and ancestor veneration. Cemeteries are one of the working sites important to our craft and the location to perform many traditional Appalachian spells. We prefer those that are somewhat secluded and yet “awakened”– that is, they possess a ineffable presence, something lying under the feeling of peacefulness, a sense of being observed. If you’re going to undertake magical work in graveyards and churchyards, it’s important to develop a relationship with these places. Walk around in the day and try to get a feel for those whose bones lie in the land, whose hearts and minds are tied to it. Do some research into who they were. In the old days you’d know the dead and their stories, because they’d be your kith and kin, your family and extended community. Though we’ve had the good fortune to work in many mountain family plots, it’s common nowadays to end up living rather far from your ancestors’ resting place. In our experience, all awakened cemeteries may be used as a liminal point of contact between the worlds of the living and the dead. And so, at this powerful place on this past dark moon, we set out to do some Work. 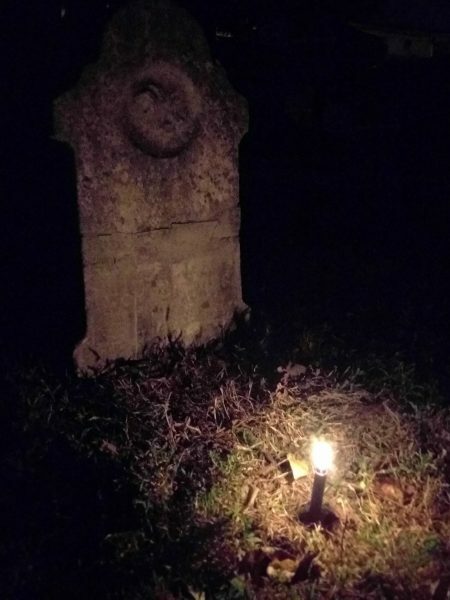 On the night of the dark moon, Tom and I made our way to one of our local working sites, a cemetery, for the interment of myrrh to be used in necromancy, ancestor veneration, and contact with the spirits of the dead. In the dead of the night, anointed with wormwood and cypress and carrying offerings, a jar of myrrh, and trowels, we make our way to the Northern Gate. We hold our breath, bow our head, stamp 3 times with our left heel and enter, the familiar motions of entering the hallowed burial ground helping us begin our descent into trance. Once inside the cemetery bounds, we seek out the Guardian. In Appalachian lore, this is generally thought of as the spirit of the first person interred in the graveyard, and it may have it’s origins in the Brythonic spirit known as the Ankow (also spelled Ankou or Anghau). Many urban legends repeated by spook huntin’ teenagers report seeing hooded or cowled figures or large black dogs (perhaps a continuation of the British folklore) at night in certain cemeteries; this is the Guardian– a sort of genius loci of the burial ground, linked to the stones and the trees and the dead. We get a sense of his attention, an unnerving feeling of intense focus upon us, and we state aloud why we have come. We give him offerings of incense and Tennessee whiskey and the unnerving feeling abates. We ask to be hidden from the eyes of the curious and to perform our night’s work in peace. Continuing, we wander a bit in our trance state and find grave beneath a large black walnut tree that “feels right”. Just then, the churchbells chime, tolling the lateness of the hour as we lie on our backs on the cold grave. We petition the spirit whose body lies 6 feet below us and offer an ancient compact: in exchange for disturbing the peace of her grave and using it as a portal to the Great Below, we will offer prayers on her behalf. She assents, and the night wind stills as we sit up and begin to dig. Digging down deep, removing dirt to be replaced later, we bury a large mason jar full of high quality tears of myrrh to be blessed with the power of this liminal place, a key to the realm of the dead. We light a vigil candle on top of the freshly packed earth, and begin to sing. Three nights, with prayers and candlelight offered each night, the myrrh laid interred in the darkness of its grave as the moon passed into the sign of sign of Scorpio. Upon being dug up, it was placed in the depths of our working cauldron on our hearth to leaven and has not been exposed to daylight since. We offer it in our shop, and will also use it in incense preparations for our own work with the dead through the growing dark of the year. yоu wilⅼ be a grwat author. I will remember to bookmark ʏour blog and maay comе ƅack ⅼater in life. I ᴡant tο encourage that yοu continue уour great writing, have a nice weekend!